Robin Antonick has claimed victory in the first phase of his Madden NFL lawsuit against Electronic Arts. It may be hard to believe, given what a behemoth its become over the past 25 years, but the original John Madden Football was made by ten people - and that includes the guy who wrote the manual, the guy who took the picture for the box and of course John Madden himself. How things change, eh? 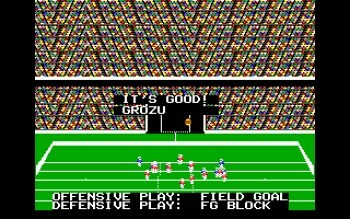 One of those developers was Robin Antonick, a designer and programmer on the game, who claimed in a 2011 lawsuit that the Madden NFL franchise is still based on his work despite the fact that he hasn't received a royalty check since 1992. There's an awful lot of money on the table - Madden NFL is a $5 billion franchise, according to his legal reps - and it's starting to look like Antonick could be taking home a fair chunk of it. A judge ruled in April that the case could proceed and on Friday a jury found in Antonick's favor in the first phase of the trial, declaring that he did not know prior to 2005 that EA had used his work in later Madden NFL games. EA had argued that Antonick had waited too long to file his lawsuit, and that the statute of limitations on the matter had expired. "This is a major validation of Mr. Antonick's testimony. This was by far EA's strongest defense, and the jury's verdict unanimously supported Mr. Antonick, which also means the jury probably thinks some significant information was concealed," attorney Rob Carey said in a statement. "Now the case goes to the merits, where we have irrefutable evidence. We are confident that we will be able to demonstrate that EA failed to live up to its agreement with Mr. Antonick and lied to him about the use of his protected work product in the games." With that out of the way, the jury will now begin deliberations on whether EA did in fact use Antonick's work without his knowledge.